Around 1900, in Glasgow Scotland, Frederick George Creed developed a keyboard-operated perforator for preparing morse-code paper tape, to be used for message transmission. This machine revolutionized the formerly hand-prepared tape process, and he started selling machines in 1902. Creed went on to develop a receiving perforator, and then a tape-driven printer which converted morse code into printed characters on paper tape -- the "Creed High Speed Automatic Printing Telegraphy System." After moving to England and joining with Harold Bille, Creed, Bille & Company was incorporated in 1912. Bille died in in 1916, and the firm later became Creed & Company. Creed equipment started moving into newspaper offices, and World War I communication roles. In the early 1920s, Creed developed a teleprinter to operate using the 5-level start/stop code, to compete with the American Morkrum system. Creed & Company went on to design an innovative line of teleprinter equipment through the years. "Creed and Company Limited. The First 50 years." "The Creed Model 7 Page Teleprinter"
This is a teleprinter which prints on narrow (3/8" wide) gummed paper tape, and was introduced in 1927 for the Post Office Telegram service. The standard signalling speed was 49 Bauds using the Murray code and not ITA2, although some ITA2 coded machines were later produced. The ITA2 coded machines may be identified by the letters A or B in place of the X in the description, and a different keyboard layout. It is possible to interwork between machines coded for Murray code and ITA2, provided that care is taken. A governed motor is fitted as standard, which may be adjusted to operate at 45.45 or 50 Bauds. This is a punched paper tape reader, with reference numbers from the original 6S introduced in 1926, to the latest model the 6S/6 introduced in 1958. Some of these tape readers were allocated the Post Office reference numbers of: "Automatic Transmitter No. 1B" (the 6S/3), "Automatic Transmitter No. 2D" (the 6S/5), "Automatic Transmitter No. 2E" (the 6S/5M), and "Automatic Transmitter No. 2F" (the 6S/6M). The output from a tape reader is a single changeover contact of exactly the same form as a teleprinter keyboard. The early machines used a governed motor operating at 3000 rpm, whilst the later machines from the 6S/3 onwards used a governed motor operating at 1500 rpm. All of these machines are suitable for operation at 45.45 or 50 Bauds. Some versions of the 6S/6 may be found with a manually operated dual speed gearbox giving the choice of 50 or 75 Bauds. The 6S/5 and 6S/6 were also available with an electromagnetic clutch on the tape drive, which is signified by the suffix "M". The clutch requires 50 volts DC at 20 mA to operate, and allows for remote tape control. As these machines also contain tape sensing contacts, the clutch may be wired in series with the sensing contacts to automatically stop transmission at the end of the tape. The 6S/6 and 6S/6M have an adjustable width tape gate in order to accept the wider 7/8" wide tape used on the model 86 printing reperforator. This is probably the most famous of the Creed page printing teleprinters, and was introduced in 1931 for the new Telex service. Like the model 3X it originally used the Murray code, but very rapidly changed to the standard ITA2 code. Over 150,000 model 7's were manufactured before production ceased in the late 1960's. The machine could be fitted with interchangeable platen assemblies for either: Friction feed paper, Sprocket feed paper, or 3/8" wide paper tape. Many variants were also manufactured as the machine was developed, and these may be identified by various suffixes after the 7. These will be described later, as some of the suffixes are common to other machines. This machine was usually fitted with a 3000 rpm governed motor for operation at 50 Bauds, which is adjustable for operation at 45.45 Bauds. Motors were produced for DC voltage ranges of 24 volts to 220 volts, and for AC voltage ranges of 110 volts to 230 volts. Some machines were fitted with a 3000 rpm synchronous motor for operation at 50 Bauds, and are not directly suitable for operation at 45.45 Bauds without an external AC mains upply running at 45.45 Hz, or some other form of electronic speed conversion. This machine was allocated the Post Office reference number "Teleprinter No. 7". 7P This is an off line keyboard perforator, introduced in 1934, whose sole function is to produce punched paper tape directly from the keyboard input. It may be found with either 1500 rpm governed or 1450 rpm induction motors. The punch mechanism is capable of working at up to 140 words per minute, so the speed of operation is entirely dependent upon the skill of the keyboard operator. A character counter is often fitted so that the carriage return and line feed characters may be inserted at the appropriate part of the text. This is essential if the contents of the tape are to be printed on a standard page teleprinter. This machine was allocated the Post Office reference number "Perforator No. 45". 7TR This is a non-printing tape reperforator, introduced in 1931, which uses a number of assemblies which are common to the model 7 teleprinter. The signal input circuit is electrically identical to a model 7 teleprinter, and the same range of motors may be encountered. The later model 7TR/3 punches two tapes simultaneously. This machine was allocated the Post Office reference number "Reperforator No. 2". 8 This is the receive only version of the model 7 teleprinter and, hence, is not fitted with a keyboard. It is otherwise identical to the model 7. 25 This is a high speed non printing tape reperforator, introduced in 1955, which operates from a parallel drive at a speed of up to 33 characters per second. The speed of operation is independent of the motor speed, and is determined by the parallel drive circuitry. This machine was usually fitted with a 1500 rpm induction motor operating from 50 Hz AC mains, but 3000 rpm governed motors for DC supplies may sometimes be found. It was designed for use with some of the early electronic computers, and may be found in versions for 5, 6, 7, or 8 unit tape, and with drive voltages from 12 volts to 100 volts DC. It is not normally used for communications purposes, but with suitable drive electronics it can be put to good use. 35 This is a high speed paper tape reader operating at a speed of up to 40 characters per second, in either direction, with a parallel output. The speed of operation is independent of the motor speed, and is determined by the control circuitry. This machine was usually fitted with a 1500 rpm induction motor operating from 50 Hz AC mains. It was designed for use with some of the early electronic computers, and may be found in versions for 5, 6, 7, or 8 unit tape, and with drive voltages from 12 volts to 100 volts DC. It is not normally used for communications purposes, but with suitable drive electronics it can be put to good use. 47 Like the model 3, this teleprinter also prints on a 3/8" wide gummed paper tape for the Post Office Telegram service, and was introduced in 1947 to replace the ageing model 3. The component parts have many similarities with the model 7, from which it was developed. Like the model 7, a governed motor was normally fitted. This machine was allocated the Post Office reference number "Teleprinter No. 11". 54 This page printing teleprinter was introduced in 1954 as a stop gap measure pending the development of a totally new teleprinter (the model 75), and is really only an advanced model 7E in an all enclosing silence cover. This makes it a very nice machine to operate. Like the model 7 a governed motor was usually fitted, although some synchronous motors may be found. A tape punch, operated from the receive mechanism, is often fitted as standard within the silencing cover. This machine was used as a print out device for some of the early electronic computers, and may be found coded for some of the early computer codes. 67 This is a combination of the model 7P keyboard perforator and the model 6S punched tape reader, which was introduced in 1934. This permits a tape to be punched, and transmitted directly to line. A governed motor operating at 1500 rpm is normally fitted, which will permit operation at 45.45 and 50 Bauds. It would be unusual to find a complete model 67, the majority of which had the transmitter head removed so that the machine reverted to a standard 7P keyboard perforator. 71 This is a multiple head punched tape reader with three independent message transmitting heads which was introduced in 1951. It is based on an American design and provides a single current output, not the standard changeover contact found in other Creed machines. It was usually used in message relay stations so that two other messages could be loaded whilst the first was being transmitted. A governed motor is normally fitted, which will permit operation at 45.45 or 50 Bauds. As a tape reader it is physically rather large. This machine was allocated the Post Office reference number "Automatic Transmitter No. 3". 72 This is a multiple head punched tape reader with three independent number transmitting heads to identify the messages being sent by the model 71 tape reader. In all other respects it is very similar to the model 71. This machine was allocated the Post Office reference number "Automatic Transmitter No. 4". 74 This is a multiple head punched tape reader and is a combination of the models 71 and 72, providing one number transmitting head and two message transmitting heads. In all other respects it is very similar to the model 71. This machine was allocated the Post Office reference number "Automatic Transmitter No. 5". 75 When this page printing teleprinter was introduced in 1958, it was the smallest, lightest, fastest, and most versatile machine in the world. It utilised a stationary paper platen, and a cylindrical type head which was driven by a complicated arrangement of levers positioned in response to the received code. The machine uses one main cam shaft for the transmit and receive functions, and provides the local copy by internal mechanical means. When used with the BARTG ST5 terminal unit a very minor wiring change is necessary to take account of this mechanical local record. It will operate at 45.45, 50 or 75 Bauds, and may be found with a dual speed gear box for 45.45 and 50 Bauds, or 50 and 75 Bauds. If the gear box is not fitted two gears will need to be replaced to change the operating speed of the machine. The standard motor fitted was a governed motor operating at 4200 rpm, but some machines were fitted with 3000 rpm synchronous motors for 50 Hz supplies, or 3600 rpm motors for 60 Hz supplies. As would be expected, the gears for the different types of motors are completely different and are not interchangeable. The various gears for the governed and 3000 rpm synchronous motors, which have colour coding spots by which they may be identified, are sometimes seen at rallies, but the gears for the 3600 rpm motors are extremely rare. Factory fitted options included a paper tape reader and/or tape punch, automatic carriage return/line feed, dual colour printing, and a choice of three or four row keyboards. The model 75 could also be supplied as a receive only machine, which could also fitted with an answer back unit and the associated transmitter contacts. This machine may also be found coded for some of the early computer codes, or with a solenoid operated parallel drive mechanism and parallel output contacts. This parallel drive version may usually be identified by the 25 way Plessey mark 4 signal connector on the rear of the machine. A modified version of this machine, which utilised a remote keyboard for use on the Telex cordless switchboards, was allocated the Post Office reference number "Teleprinter No. 12". 85 This is a printing reperforator, introduced in 1948, similar to the model 7 page printing teleprinter, but fitted with a perforating unit fitted in place of the paper platen. The perforator is designed to produce "chadless" tape, which means that the holes in the tape are not punched cleanly, but the chads are still attached to the tape by means of a small flap. The text is then printed directly on top of the tape. This style of tape may be read by any of the standard range of punched tape readers. The same range of motors as fitted to the model 7 are also fitted to this machine. This machine was allocated the Post Office reference number "Printing Reperforator No. 1". The receive only version of this machine, the model 85R, was allocated the Post Office reference number "Printing Reperforator No. 2". 86 This is a printing reperforator, similar in most respects to the model 85, but using 7/8" wide tape instead of the standard 11/16" wide tape, and printing the text below the clean punched holes. This tape may be read using the 6S/6 series of tape readers, which are fitted with an adjustable width tape gate. The same range of motors as fitted to the model 7 are also fitted to this machine. This machine was allocated the Post Office reference number "Printing Reperforator No. 1D". The receive only version of this machine, the model 86R, was allocated the Post Office reference number "Printing Reperforator No. 2D". 92 This is an electromagnetically operated punched paper tape reader, introduced in 1957, which operates at speeds up to 20 characters per second with a parallel output. It was designed for use with some of the early electronic computers, and may be found in versions for 5, 6, 7 or 8 unit tape, with drive voltages from 12 volts to 100 volts DC. It is not generally used for communications purposes but with suitable drive electronics it can be put to good use. The mark 1 and mark 2 versions caused very high tape wear, which was corrected in the mark 3 version by redesigning the tape sensing mechanism. 444 This page printing teleprinter was introduced in 1966 to replace the ageing model 7 in the Telex and private wire services. It was designed to operate continuously at 75 Bauds, and was only provided with gears for 50 and 75 Bauds. It was usually fitted with a 3000 rpm synchronous motor for 50 Hz AC supplies, but a few machines fitted with 3750 rpm governed motors may be found. Machines for export were sometimes fitted with 3600 rpm synchronous motors for 60 Hz AC supplies, but these are now extremely rare. A replacement 45.45 Baud gear for 50 Baud machines fitted with the 3000 rpm synchronous motor was available from BARTG some years ago, but the stocks have long since been used up, and there are no plans to produce any more. This machine is often fitted with a built in tape punch, a paper tape reader, dual colour printing, and a "stunt box" for character recognition. It is a very nice machine to operate and, due to its all enclosing cover, is very quiet in operation. This machine was allocated the Post Office reference number "Teleprinter No. 15". 750 This page printing teleprinter is a very rare development of the model 75, and uses separate transmit and receive camshafts in a similar manner to other Creed teleprinters. Visually, it is slightly larger than the model 75 in order to accommodate the two camshafts. Very little information is available for this machine, and any intending purchaser should ask for a demonstration of the machine in operation. 2300 This semi-electronic page printing teleprinter, introduced in 1974, was intended as a general replacement for the entirely mechanical model 444 in the Telex and private wire services. However, due to the variety of options available, it eventually became uneconomic to manufacture, and was overtaken by the emerging electronic teleprinters. The timing is crystal controlled, and was normally adjustable for 50, 75 and 100 Bauds. By changing the crystal, operation at 45.45 Bauds is possible. The electronic section contains a number of non standard integrated circuits and, if a serious problem develops, it may prove very difficult to cure. The machine was normally fitted with a 3000 rpm synchronous motor to drive the rotating print head. Characters were printed "on the fly" by a type hammer located behind the paper, without stopping the actual rotation of the print head. This machine was allocated the Post Office reference number "Teleprinter No. 23". A Normally means that the machine transmits a 7.5 unit character and receives in a 7.0 unit cycle; 66 wpm at 50 Bauds. This was the early transmit and receive configuration, and is not often encountered. A When applied to the Post Office versions of the model 70 series of tape readers it indicates that the transmitter is configured for a 7.42 unit character. ASR Automatic Send Receive. 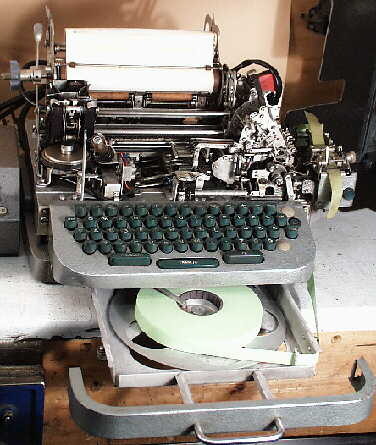 A machine fitted with a tape punch and tape reader. Often used with the model 444 teleprinter. B Normally means that the machine transmits a 7.5 unit character and receives in a 6.5 unit cycle; 66 wpm at 50 Bauds. This is the standard transmit and receive configuration. B When applied to the Post Office versions of the model 70 series of tape readers it indicates that the transmitter is configured for a 7.5 unit character. C Normally means that the machine transmits a 7.0 unit character and receives in a 6.5 unit cycle; 71.4 wpm at 50 Bauds. This was mainly used on private wire circuits. C When applied to the Post Office versions of the model 70 series of tape readers it indicates that the transmitter is configured for a 7.0 unit character. CTK Commercial Typewriter Keyboard. This was used on the model 7 series of machines so that an ordinary typist could use a teleprinter without any special training. It is very complex mechanically, and uses mechanical character storage to automatically insert the figures and letter shift signals, but is very easy to use. D Normally applied to the model 7 teleprinter to indicate that the machine has been modified for the Telex service, and that it is fitted with motor on-speed contacts, an improved answer back unit, and a 33 way signals plug. The machine still transmits a 7.5 unit character and receives in a 6.5 unit cycle; 66 wpm at 50 Bauds. D When applied to the standard versions of the model 70 series of tape readers it indicates that the transmitter is configured for a 7.42 unit character. E Normally applied to a model 7 teleprinter to indicate that the machine is fitted with the later overlap cam unit. This cam unit consists of three separate cam shafts, and allows characters to be printed as soon as they are received, rather than being printed when the next character is received as in the earlier versions of the model 7. This cam unit is fitted as standard to the model 54 teleprinter. K3 The three row keyboard used on the model 75 teleprinter. K4 The four row teleprinter used on the model 75 teleprinter. KSR Keyboard Send Receive. A machine not fitted with either a tape punch or tape reader. Often used with the model 444 teleprinter. M Fitted with an electro-magnetic clutch. Applied to the model 6S series of tape readers only. M3 The three row keyboard used on the earlier model 7 series of machines. Rather heavy in operation, but very reliable. N3 The three row keyboard used on the later model 7, 47 and 54 series of machines. A very nice keyboard. N4 The four row keyboard used on the later model 7, 47 and 54 series of machines. A very nice keyboard. P Fitted with a punched tape perforating attachment which is directly operated by the action of the keyboard. PR Printing Reperforator. A machine which produces punched paper tape directly from the received signal, and prints the text between the feed holes. Applied to the model 75 teleprinter only. R Receive only version of a machine. That is, no keyboard or transmitting mechanism is fitted. RO Receive Only version of a machine. That is, no keyboard or transmitting mechanism is fitted. Often used with the model 444 teleprinter. RP Fitted with a punched tape reperforating attachment which is operated directly by the received signal. Due to the wide variety of equipment which may be encountered, only the standard connections to the Creed machines, which are the ones most likely to be encountered, will be considered. The standard signalling connector for the majority of Creed machines is the 12 pin Multicon (miniature Jones), with the male plug connected to the machine. An additional connector, the Plessey mark 4 circular connector, was also used on the model 75 series of machines so that the power and signalling leads could be disconnected. The pin designations for the 12 way Plessey mark 4 signal connector are given in the (.) brackets. Some early Creed machines used a large 9 pin, round pin, plug for the signals connections. The pin designations for this 9 pin plug are given in the [.] brackets. 1. On the 444 teleprinter, link pin 12 to pin 13 on the 50 way connector, the other connections remain the same. 2. For "Mark", current should flow into pin 7 and out of pin 9. 3. This contact closes when the "Bell" character, figures shift J, is received. 4. This pin may be bonded to the machine chassis. 5. This contact closes when the "Who Are You" character, figures shift D, is received. If the machine is fitted with an Answer Back unit, a 20 character message will also be transmitted to line. 6. For punched tape readers, only pins 1 to 6 inclusive apply. Creed model 75 Teleprinter (shown with cover off), a Creed power unit, Creed output printer/transmitter GP1 ARR3, and a Creed automatic transmitter model 6S/6M.